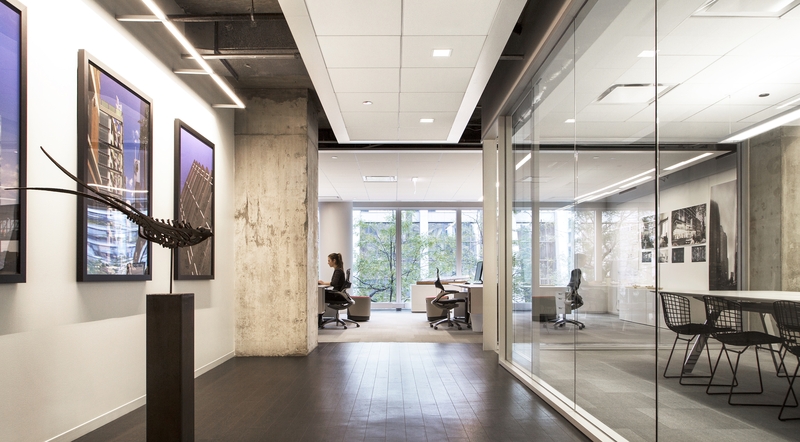 A new architecture firm was seeking office space in Chicago’s Loop. Critical design considerations included creating a collaborative studio that expressed the firm’s belief in day lit workspace with views to nature. Suite 205 at 55 West Monroe, an unfinished former commercial bank and retail space overlooking Exelon Plaza, (formerly First National Bank Plaza) provided the starting canvas. Vertical and horizontal proximity to the light, life and views of both the streetscape and plaza, informed the “L” shaped plan; this visual discussion of office to garden begins at the arrival library lobby and continues via a gallery that links kitchenette, conference room and studio workspace. 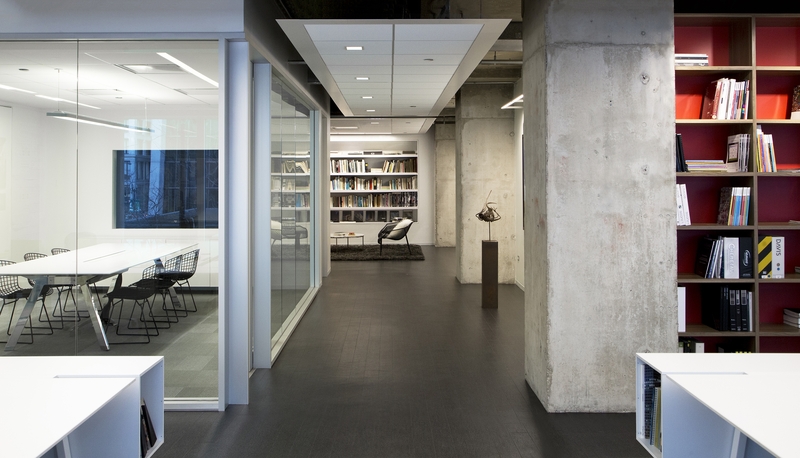 Light colored walls, floating cloud ceilings and furniture further emphasize the gathering and movement of exterior light into the space, including an all-glass conference room that draws light and views even deeper into and through the office. Existing raw concrete columns, ceiling and MEP systems are left exposed, celebrating the base-building systems with carefully crafted new construction. Built-in bookcases in the library lobby and studio work area, create visual texture and warmth while maximizing storage. A firm-designed lobby mural of Chicago and the gallery space promote client discussion of past, present and future projects. Modular workstations are perpendicular to the exterior windows to maintain open views to the exterior and minimize glare on work surfaces. Sustainable aspects include careful attention to material selection: low-VOC paints; flooring materials with recycled content; all LED lighting; a reduction of new materials use by leaving the existing structure exposed; and an emphasis on maximizing natural daylighting through use of light-colored materials and unobstructed windows. 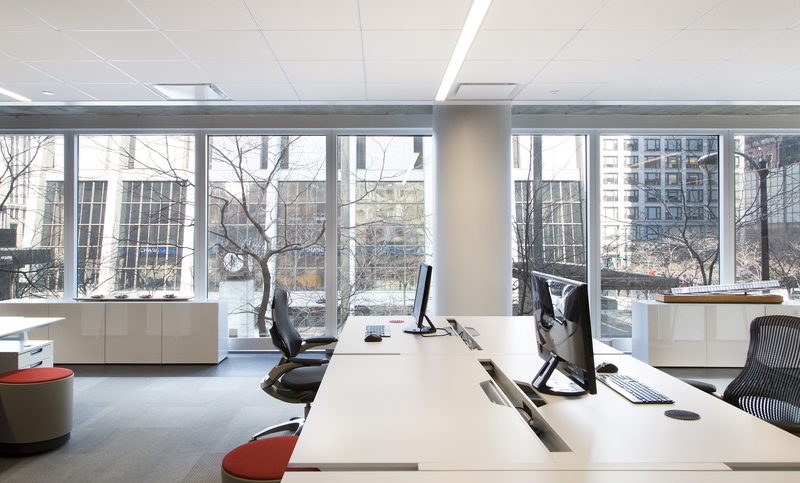 The office utilizes exterior natural light as a primary light source during daytime hours.